Elegantly decorated ocean side “home-away-from-home” beach house is located in the exclusive North End of Long Beach Island and is just steps from the beach with its own private easement. You’ll not only hear the sounds of the surf, but will have a partial deck view of bay and ocean. The life guard stand is located close to the beach entrance. Our beach home is the only one on the island that offers additional packages for convenience and pleasure, including sheets, badges, kayak, paddle boat and/or motor boat, so sit back, relax and soak up the sun. This lovely 5 bedroom house includes four bedrooms within the house and one separate bedroom attached. it includes two full size bunk beds and is completely furnished. There are three FULL bathrooms, a double outdoor shower, and separate foot shower for rinsing off the sand. This house will easily accommodate up to 12 people (two families), and features an exquisite totally private master grand suite with king bed, private bathroom, plasma TV and private deck. Other bedrooms include a queen master bedroom, with private bath and queen bed; one bedroom with two full beds and one bedroom with two twin beds. Upon entering you will instantly relax in the beautifully decorated and peaceful atmosphere. This house includes TVs in every bedroom (3 plasmas) and two others including 61” high definition TV in family room. 1. 8 beach passes, valued at $30.00 each = $240.00, beach passes must be returned at the end of your visit; sheets for every bed, 10 house towels and 10 beach towels; in addition 5 new beach chairs, 5 new beach umbrellas . Also the use of a heavy duty ping-pong table located in a covered area which can be used even on a rainy day! unlimited use of a new tandem seat kayak & Single Kayak life jackets (photo displayed). Kayaks rent locally for $85.00 for 4 hours. Kayak without Master Pkg. is $295.00. 3. For an additional $95.00 weekly, less than $4.00 daily per bike, the unlimited use of 2 brand new ladies cruiser beach bikes and 1 men's mountain bikes, (photo displayed); bikes rent locally for $40.00 per day please lock bikes for security. To keep in good condition bikes must be stored in shed and must be returned in same condition as when received. If you use a bike helmet please bring it with you. 4 bicycles without Master Pkg. is $195.00 for the week. stand-up paddle board boasts a lightweight design that makes transport a breeze. It tracks and paddles with ease while offering maximum stability, and the non-slip foot pads offer even greater security. OTTER is a perfect choice for beginner and entry level paddlers. The primary advantage to hybrid sups is their ability to perform well in nearly any environment. OTTER features moderate rocker and a wider platform for maximum stability in calm or wind-chopped waters. 5. For an additional $595.00 weekly or $195.00(20g gas &oil) (8hours,a day) enjoy the use of a 16 ft. motorized boat, parked in the bay for your convenience. Boat will be provided with a full tank of gas Great family fun for fishing or enjoying a beautiful sunset! Boating license is a must and copy of license must be provided. 6.FOR AN ADDITIONAL $95.00 PLUS TOTAL OF RECEIPTS WE WILL DO ALL YOUR LIQUOR AND FOOD SHOPPING SO YOU CAN ENJOY YOUR GLASS OF WINE OR COLD CHILLED BEER FROM THE MINUTE YOU WALK IN THE DOOR!!!! Come have fun and enjoy fishing, swimming, boating, surfing, windsurfing, jet-skiing, biking, shopping and of course dining at our terrific restaurants. Whether walking on the beach or sailing into the sunset, special lifetime memories will be created with your family and friends. Long Beach Island is as beautiful as it is fun! Some of the available activities include swimming,fishing,sailing,bicycle riding,surfing, kayaking, walking the beach and watching some of the loveliest sunsets we have ever seen. The invigorating smell of the ocean and peacefulness of listening to the ocean waves and birds, any season of the year. partial ocean view from master deck & partial bay view front house deck. House is 4th from the ocean, approximately 125 ft. from the beach; no street to cross to go to the ocean. -------Included with your rental is: 55' Plasma TV. in living room with CD/ DVD player; 2 bedrooms with DVD -19' PLASMA TV , small bedroom with 19' wall TV; Master Bedroom with 42' Plasma TV & DVD player, Phone, Full Kitchen, Microwave, Dishwasher; 2 Refrigerators, Cooking Utensils provided, 1-Full size washer & dryer, 8 NEW Beach Chairs & 2 NEW beach umbrellas, large wheel chair carrier for beach, internet, ping-ping table in covered outdoor area, additional 2 FOLDING Beds -(not included in sleeping count), small crib available, Pets NOT allowed, No Smoking---- Beds: One King -Master, 1 Queen-second master, 2 Twin beds, 2 full beds, 2 full size bunk beds, & 2 Folding Beds. Harvey Cedars is a magical place to stay. We enjoyed every moment with our family. Short walk to the beach, we purchased the extra package to avoid carting chairs and umbrella's, sheets and towels. I would have loved having a few extra's but it's all good. The house is very nice, yes dated, but a beach home away from home. The kayak's are bay boat's not ocean kayaks. You would need a way to get them to the bay. Paddle boarding was a lot of fun. The weather was perfect, so no need for indoor games, but ping pong and other board games were available. Once back at the house we chilled, enjoyed relaxing and the local seafood. I am looking forward to our next trip. the kayaks have a stand with 2 wheels to carry it to the bay . thanks for you kind review and We love to have you back . Excellent location with easy access to beach and fun activities. Fantastic and beautiful outdoor living area with plenty of seating. The ping pong table was a fun addition to the house. We appreciated the freshly painted walls and overall clean appearance. More than ample parking and dinnerware. Some of the mattresses need replacing. Unit description should say that the bedroom with the private entrance has no indoor access to rest of house. Although it says “private entrance,” we were surprised to find that you have to leave the bedroom, go outside and upstairs to enter the main house to use the bathroom. But if you go back to VRBO.COM Webit very clearlly SAY'S and I code . Detached bonus bedroom (#5); is a bedroom with two full size bunk beds which is attached to the exterior of the house, without direct access to the interior of the home. It is necessary to use the exterior stair entrance to enter the house from this bedroom and to have access to a bathroom. This bedroom is perfect for a babysitter, or mature adults but is not recommended for young children. Keywords: Single Family. it have been in the property Description for over 7 years ,u can call VRBO and check ,to make sure we did't add it just now after you review . Easy beach access. Owner was friendly and helpful. Provided everything we needed to enjoy the beach. The location to the beach is perfect. Easy access and just a quick walk...and I mean quick! There were two grills for cooking, lots of furniture outside for enjoying, however, the house is tired, and in desperate need of updating. Master suite is extremely large on the second level. The balance of the bedrooms are modest but the size is adequate. Bathrooms are ridiculously dated. Kitchen very small and not very well stocked. I must say that when we had a problem, the owner was very responsive. Air conditioning is problematic. Thank you for taking the time to write a review in regards to your recent stay. I am happy to hear you enjoyed the location of the house; with only a short walk to a private beach. The style of the home is a charming traditional New Jersey style beach house, with twenty six photos covering the ins and outs of the home, so the renters have a candid view of the home before arriving. The top floor of the house is solely a master suite, including a king size bed, its own living area, a full bathroom, and a private balcony. The large size of this suite is something a lot of the renters find very relaxing and appealing; I am sorry you felt as if this suite was too big for your liking. This house is outfitted to accommodate families of all sizes, which is why we provide an array of bedrooms, I am happy to hear you were pleased with this. Our kitchen is a full kitchen including a brand new refrigerator, new dishwasher, new microwave and a 4 burner stainless steel stove. We offer a full set of plates - big and small, bowls, silverware, glasses, pots and pans, Tupperware, a traditional coffee maker, and Keurig, and even a rice cooker. The kitchen runs alongside an indoor dining space with a big table to seat a large group, in addition to the four outdoor dining spaces, equipped with an outdoor flat screen TV. We are the only rental property that offers two grills and extensive outdoor seating, in order to comfortably satisfy larger groups, which we frequently have. The amenities of the house were thought of in regards to being relaxing, enjoyable, and more importantly cost saving for our renters. LBI offers many restaurants, (pricey) entertainment rentals (such as kayaking, biking, boating, beach passes, and so on), as well as outdoor relaxing areas. I put a lot of emphasis on incorporating all of these things into my rental property, so my renters don’t have to go far or spend additional money to enjoy these things, unless wanted. The house is and has been updated each year for the past ten in years to reflect the feedback I get from my renters to make the home more enjoyable for everyone. I thank you for your review, and hope to see you again. just returned from a memorable week at this rental in Harvey Cedars and can only say we were completely satisfied with this property. We had 8 adults and six children ages 2 through 11 and the house met our every need. Easy access to the beach with a lifeguard stand right there. We had beautiful weather the entire time and the beach was absolutely beautiful. The house was very clean and so well stocked. Loved all the beach chairs and umbrellas and the two carts to carry everything to and from the beach. The outdoor seating area with the tables and chairs, refrigerator and two grills was an added bonus and ideal setting for our extended family who were all vacationing this week on LBI. Highly recommend this rental for large families. We will be back. From the Northwest (Washington, state) I've never been to the East Coast. This was the first experience and I can't wait to go back. Stayed at this wonderful home summer of 2015. Beautiful home that accompanies all the things you and you family need for your duration. The location is a prime location for easy access to both the beach and the bay. 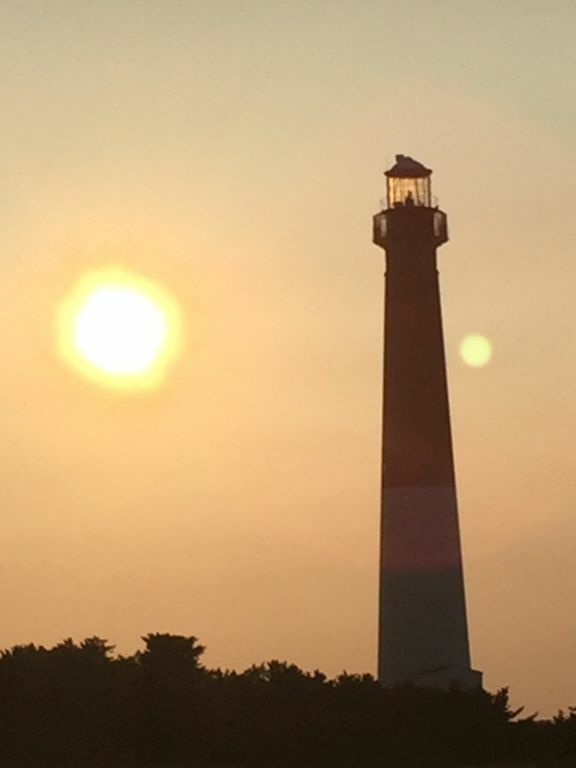 What the owners offer for recreational is great and makes your experiences at LBI even better. The patio is wonderful and very classy for outside dinners. This vacation house offers you that "vacation" feeling that we all dream of. Highly recommended for family vacations. Close to beautiful Sunset Park (4/10 mile) which offers many activities for both children & adults including basketball & tennis courts, baseball & soccer fields, organized activities and playgrounds for children, picnic tables,gazebo and spectacular sunsets!